March 21, 2014, Oakland, Calif. – We are racing toward the end of the “rainy” season in California, with only a few weeks left. As we approach the normally dry spring and summer months, the scope and severity of California’s drought will become more apparent. As of today, however, it appears extremely unlikely that nature will provide much relief, and increasingly likely that California will be faced with unprecedentedly dry conditions, with impacts to all sectors and every corner of the state. As part of the Pacific Institute’s Drought Response efforts, here is an update of the key information and graphics that characterize the current drought. Much of this information can be found, regularly updated, at the California Drought website: www.californiadrought.org. Effectively 100% of California is experiencing abnormally dry to exceptional drought conditions, as reported by the U.S. Drought Monitor. This map shows the extraordinary precipitation deficit since the start of California’s water year on October 1st from NOAA’s Climate Data Center through March 20th. A key component of California’s water supply system is the winter storage of snowpack and its slow release during spring and summer months. This year, the Sierra Nevada current snowpack is near record lows and the water storage is only 25% of normal and dropping every day. 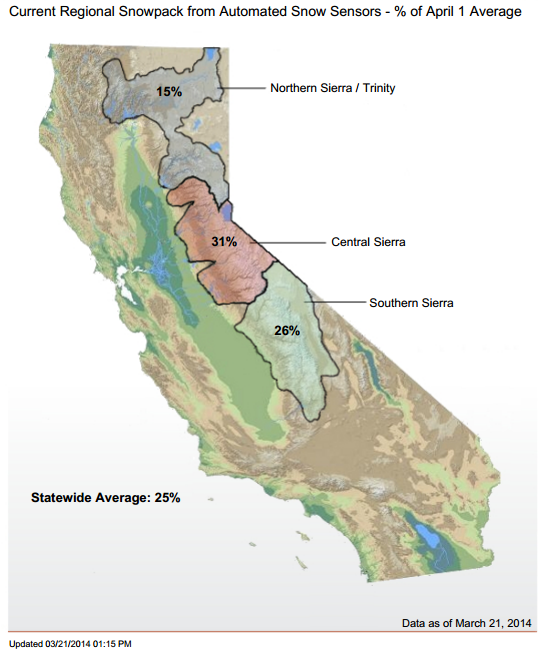 California has built a massive amount of reservoir storage – over 45 million acre-feet of capacity. But high demand and low rainfall has led to substantial drops in water stored in these reservoirs. 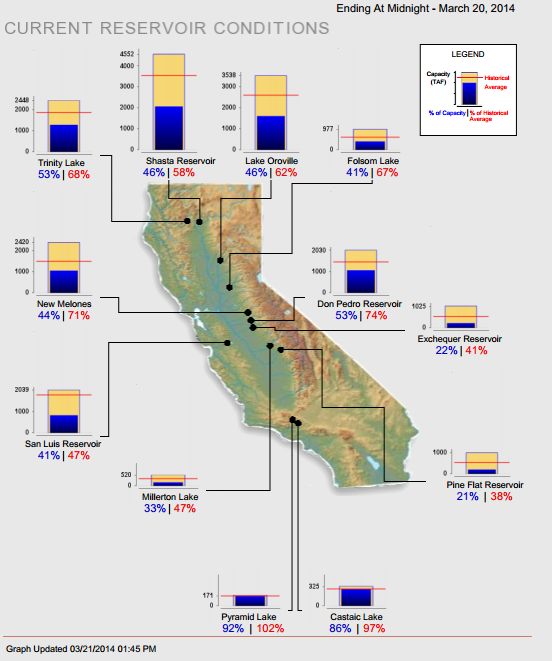 This graphic from the Department of Water Resources, updated today, shows that the state’s most important reservoirs are at around 40-50% of capacity, and well below the average for this date. A measure of drought of special importance for agriculture is the amount of moisture held in soils. 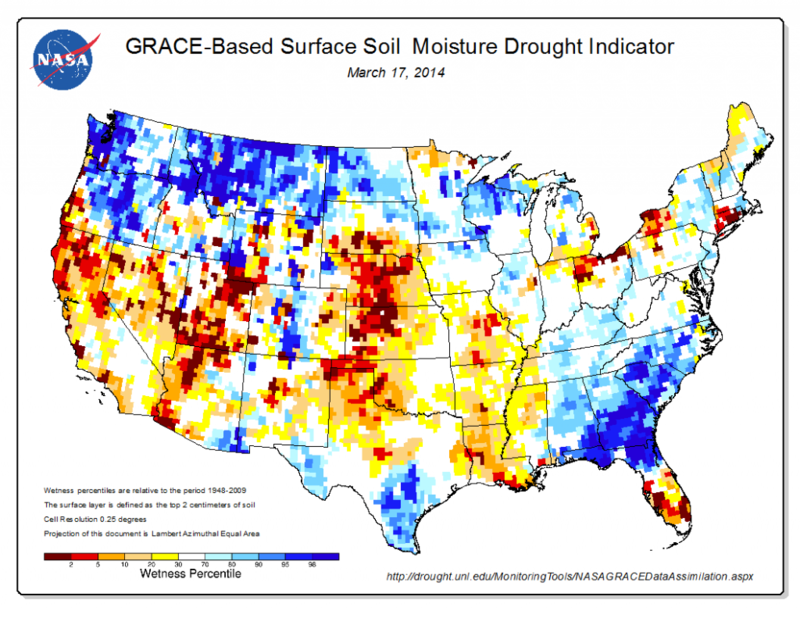 As estimated by the GRACE satellite system operated by NASA, California soil moisture is extremely low. This will have serious consequences for farmers planning 2014 production. Hydropower Generation: California’s ability to generate hydroelectricity always drops during droughts, leading to higher costs, greater use of fossil fuels, and increased emissions of greenhouse gases. We’ll evaluate this problem as the season continues. Fire Frequency: The risks of wildfires increase during droughts. We’ll report on the fire season later in the year. Agricultural Production: There is concern about impacts of water shortages on farm production, employment, and income, but until data are available on actual production, acreages left fallow, crop prices for California’s commodities, and more, it is not possible to accurately estimate what the overall impacts will be. We will report on this later in the year as data become available. Fisheries Impacts: California has, for many years, perched on the edge of ecological fisheries collapse, especially in the Sacramento-San Joaquin Delta region. New pressures on water resources imposed by the drought and by growing demands to weaken environmental protections will have an impact on California’s fisheries that will become evident later in the year and in subsequent years. 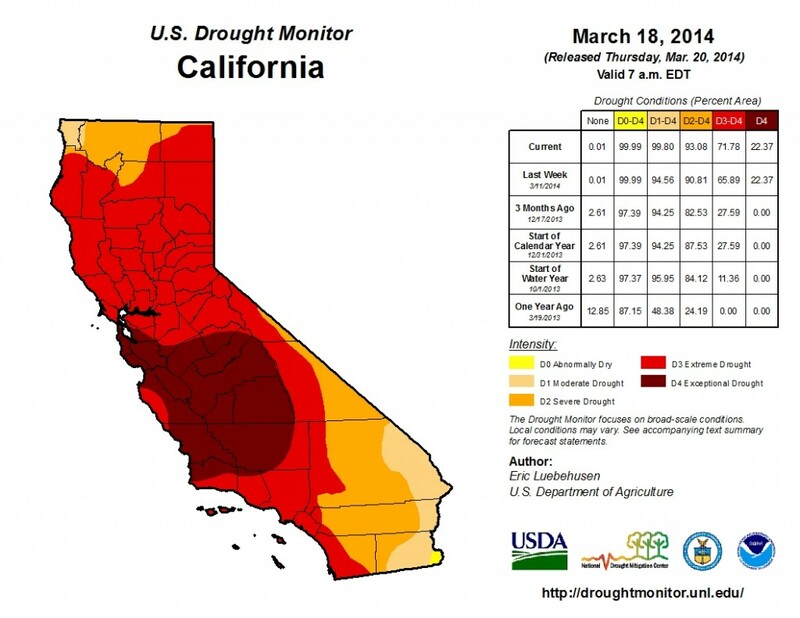 For more information, visit the California Drought website.